This was the first piece of my wardrobe I made, and looking back now I can see how bad it is! After I came home with the fabric for my chemise, panniers and stays, I was eager to get started. Made from a fine white cotton, the pattern is Variation A from La Couturière Parisienne, originally from Garsault's L'art de la lingère I believe. The chemise is stitched in the most awful silvery polyester thread. Wanting to get started and having no white or cream thread in the house, I used some I got for free with my very first sewing machine. Needless to say it looks terrible, but only up close. The sleeve length and width are slightly off for the 1780's. Longer and narrower sleeves would have been better, but I can also wear this with earlier shorter sleeved dresses. 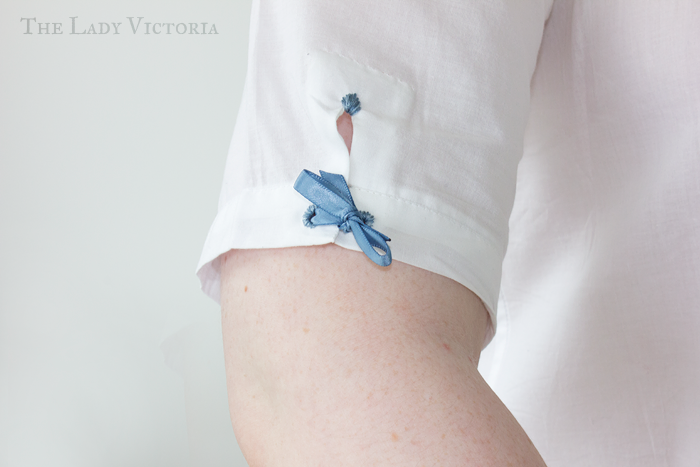 The cuff placket is undocumented, but I liked the idea of finishing the sleeves with a little bit of ribbon. The neckline is a rounded square, but gathered slightly with matching ribbon. 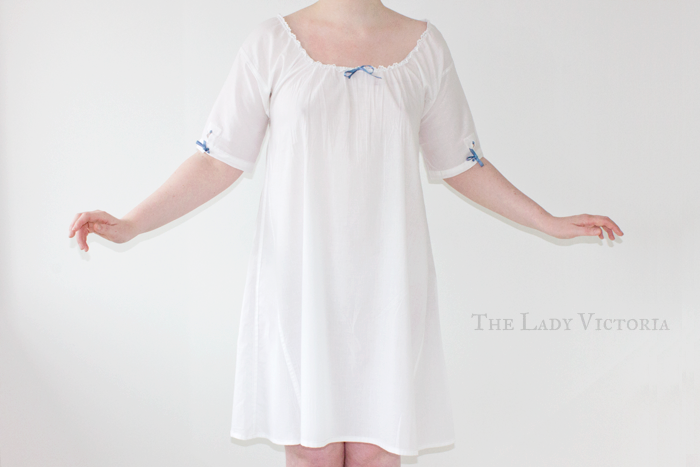 It works nicely with the neckline of my stays, and I didn't have the stays made up to trace an exact neckline anyway. 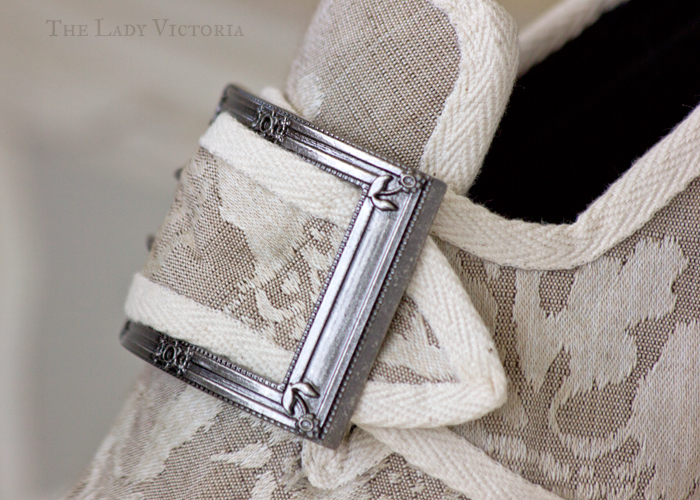 The neckline is edged with 1cm wide cotton lace. In La Couturière Parisienne's tutorial there is mention of lawn or batiste ruffles around the neckline. Somehow I misinterpreted this as there being lace around the neckline...the effect is quite appealing, if totally inaccurate. Despite all of this, they do their job well enough. Time will tell if the sleeve ribbons will get in the way or if the cotton lace will itch, but I do like my little mutant chemise. 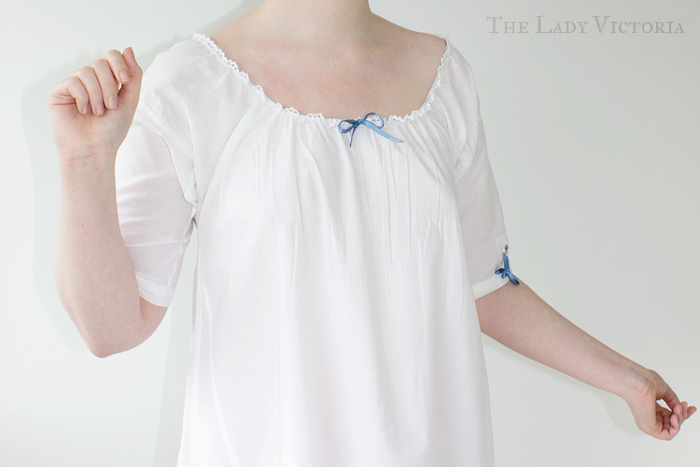 After completing my first Robe L'anglaise I want to go back and make a proper chemise to atone for my sins. Fine linen, hand sewn and no silver thread in sight.